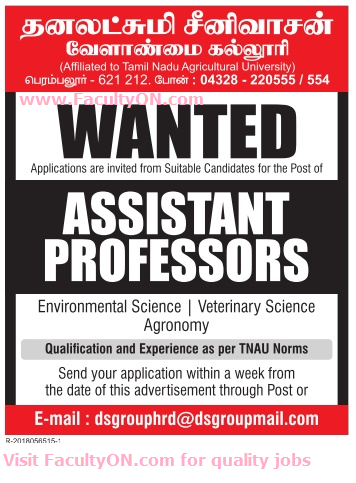 Dhanalakshmi Srinivasan Agriculture College, Perambalur has advertised in the DINAMALAR newspaper for the recruitment of Teaching Faculty- Assistant Professor jobs vacancies. Interested and eligible job aspirants are requested to apply within 07 days from 15th July 2018. Check out further more details below. About College: Dhanalakshmi Srinivasan Agriculture College was established in the year 2017 under the Dhanalakshmi Srinivasan Charitable and Educational Trust with an aim to convert student resource into strong national assets. We have got the approval to start B.Sc. Agriculture and got affiliated to The Tamil Nadu Agricultural University, Coimbatore.